This system has one station at the door/gate and has the option of one or two master station(s) in the house. 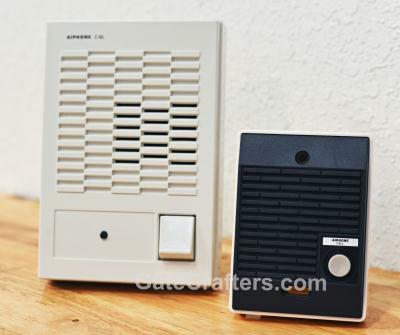 The classic intercom is a simple as it gets, and with simplicity comes reliability. From the door/gate station you will run a 2 conductor wire to the indoor station(s) and from the indoor station(s) you will run a 2 conductor wire to the gate. The gate/door release button is active all the time; it can be used anytime to open the gate, not just when someone calls in. Talk to your guest and open the gate with 2 buttons... simplicity. System automatically turns off in 15 seconds.